Pyt-Yakh, 29 August 2017. SIBUR has completed the upgrade of the Yuzhno-Balyksky Gas Processing Plant (GPP), which covered up to 30% of the plant's capacities and made it possible to additionally produce more than 100 ktpa of natural gas liquids (NGLs). 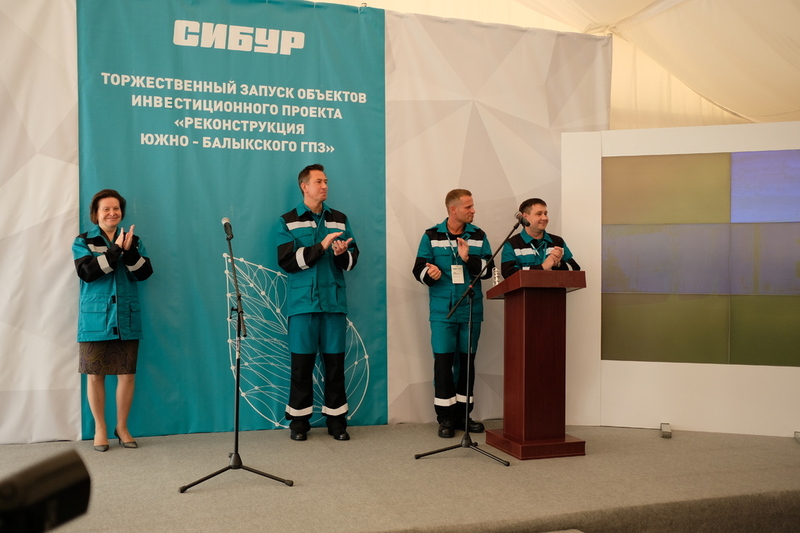 The opening ceremony that followed the completion of the major upgrade exercise was attended by Natalya Komarova, Governor of the Khanty-Mansi Autonomous Area – Yugra, Dmitry Konov, Chairman of SIBUR's Management Board, and other representatives of the Company's management. Yuzhno-Balyksky GPP is one of SIBUR's largest gas processing plants. The plant has an annual APG (associated petroleum gas) processing capacity of over 3 bcm, preventing greenhouse gas emissions of around 10 mt of CO2 equivalent per year. Yuzhno-Balyksky GPP produces dry stripped gas and NGLs, which comprise the key feedstock for SIBUR`s petrochemical facilities that make plastics, rubbers and other products. NGL output exceeds 1 mtpa. Dry stripped gas is supplied to Gazprom's gas transportation system. The plant’s major overhaul, aimed at upgrading its production capacities and enhancing the efficiency of APG processing, began in 2014. It was part of the programme of government support for investment projects implemented in Russia. Total project investments were around RUB 2.9 bn. The overhaul exercise covered six production units, including a low-temperature condensing and rectification unit, where new equipment was installed. This helped raise the unit's output to 2.89 bcm a year, with recovery rate of target APG components reaching 98% in line with global best practices. On top of that, the project saw the construction and launch of five new units, including an adsorption dehydration unit and a compressor booster station with annual output of 2 bcm and 1.5 bcm, respectively. NIPIgaspererabotka, a leading Russian centre for facility design, supply, logistics and construction, was selected as the general designer for the reconstruction project. Construction and installation works were carried out by Russian companies, with Neftmontazh engaged as the general contractor. The key suppliers of equipment and materials were Russia's RAN Complect, Penzneftekhimmash, Kazankompressormash, Lenmashneftekhim and IMS Industries. Localisation of the equipment and materials supplied for the project totalled 99%.